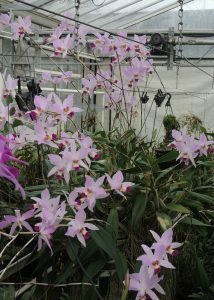 This wonderful orchid is always in full flower for our annual Orchid Christmas Celebration. Flowers are really variable in shape and colour as shown by the three photos. 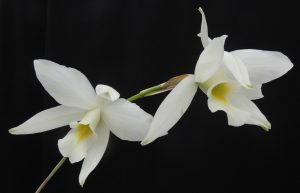 The first is a more normal punk clone, the second is the very large flowered and large growing Laelia anceps ‘veitchiana’ and the third is an alba variety that opens greenish and then becomes pure white with a yellow centre to the lip. The roof of Cool Americas is full of Lealia anceps flowers and it will stay that way until the end of January – very lovely in the darkest months of the winter. This species is widely reported as being a significant part of the Mexican festival, Dia de los Muertos (Day of the Dead) which takes place at the end of October, but for us, this is a Christmas orchid. Perhaps it is the the climate in the UK or the cool temperatures of our Cool Americas section but all of our many clones flower from November to January with their peak at Christmas. The flowers are large and on strong spikes 80cm long with three to six flowers on a spike. The species is native to Mexico, Guatemala and Honduras where it grows in pine oak forest and coffee plantations from 500-1500m altitude. 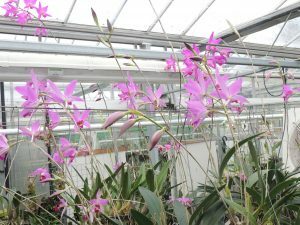 The wide distribution of the species and its relatively harsh habitat help to explain the ease with which the plant grows in cultivation and its tolerance of both high temperatures in the summer and cool temperatures in the winter. The wide distribution also gives rise to a wide variety of forms. 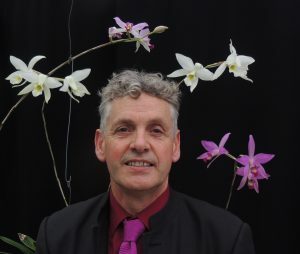 Do come to the greenhouse this evening from 6-9pm for Orchid Christmas and a chance to enjoy these wonderful orchids as well as mulled wine, mince pies and good company. 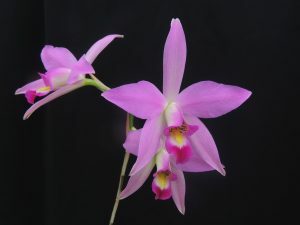 We do have several different Laelia anceps plants for sale. 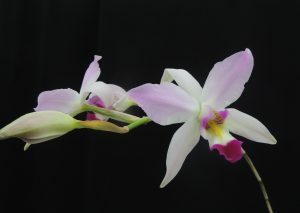 Laelia anceps ‘veitchiana’ another orchid from the Veitch and Son Nursery? I love the coordinated tie with the “normal punk clone”. ( no safety pins though ) Absolutely fantastic!